Springfield, OH: Crowell Publishing Company, 1932. First appearance of the Dashiell Hammett short story, "A Man Called Spade," in the July 1932 issue of The American Magazine, a monthly publication featuring fiction, articles, and illustrations. Hammett's story is illustrated by Joseph Clement, and the author receives a front cover credit. The first of three magazine appearances of private detective protagonist Spade. Spade made his debut in Hammett's 1930 novel, "The Maltese Falcon," and made three subsequent magazine appearances in short stories. The three Same Spade short stories were first collected in the 1944 digest, "The Adventures of Sam Spade and Other Stories," published by Mercury. Other contributors to the issue include Octavus Roy Cohen, Beverly Smith, Archibald Rutledge, Courtney Ryley Cooper, Everett Rhodes Castle, and more, with art by Saul Tepper, Weldon Trench, C. Peter Helck, Harvey Dunn, and more. Cover art by John E. Sheridan. Approximately 8.5. x 11.5 inches, perfect bound. Very Good, with a moderate chips to the wrappers, an owner label, brief ink notations on the rear wrapper and first page. Layman A11.1.a., C 122. Springfield, OH: Crowell. 1932. First Appearance.. First publication in the July 1932 issue of The American Magazine. Mailing label removed from lower corner front cover otherwise near fine. Stated on the front cover is "Complete in this issue A Mystery Story By Dashiell Hammett." 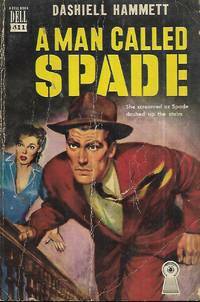 Subsequently appeared in the 1936 collection, Good Stories edited by Fran Luther Mott, and subsequently in Ellery Queen's 1944 collection,The Adventures of Sam Spade. .
Dell Mapback #90 1945 1st prtg. rc, light wear along spine edges, cple of creases else near fine. 1st prtg. rc, light wear along spine edges, cple of creases else near fine..
New York: Dell. Near Fine. 1950. Dell Mapback No. 411. Paperback Reissue of Dell Mapback No. 90 with a differnent cover. Reading crease on front cover otherwise near fine in wrappers. .
Manchester: Carcanet New Press Limited, 1978. First English Edition. Near Fine book in a Very Good dust jacket. Dell A must for the Hammett completist. This near new copy of the Dell mapbook still has strong binding, clean text. Super copy.. Mass Market Paperback. Good +. New York: Dell, 1944. 1st Edition thus . Soft cover. Near Fine. 8305 shelf. Dell #452. Mass market paperback, pictorial covers, red-brown spine, no printed cover price. No names, clean text. Lovely collectible superior copy! Map on back is apartment of "Max Bliss." Cover quotation: "She screamed as Spade dashed up the stairs. Dell, 1952. Book. Fair. Soft cover. First Ed Thus. First paperback ed. thus. Fair condition, over all wear, cover creases, moisture stain to spine edges, spine wear. Dell #452..
NY:: Dell,. 1944. 12mo - over 6?" - 7?" tall. Book. S Mass Market Paperback. Good. Card covers, 192.pp. Dell #90. Introduction by Ellery Queen. Illustration of one story's scene on back cover. 5 short stories (3 of them about Sam Spade) by the 20th century's greatest mystery writer. Front and back covers still colorful but with some wear and rubbing along edges; surface of upper forecorner of front cover rubbed off. Spine a bit curled and slanted with wear along edges and a little splitting along back edge. New York: Dell, 1945. Book. Illus. by Gregg, Gerald. Good. Paperback. First Paperback Edition. PON to inside cover, otherwise a Good copy. Dell #90. First printing..